The DVD Study is a key feature to the understanding and application of the Unlocking the Destinies from the Courts of Heaven Curriculum Course. Each DVD Study features Robert Henderson as he takes participants through a prophetic prayer strategy that includes addressing God as Father, Friend, and Judge. This approach helps the participant Understand the protocol for entering into the Courts of Heaven to present their case before God as Judge dissolving curses that delay and deny our futures. The DVD study includes three discs containing each of the Basic Principles of the course. Concepts are introduced that include a Three Dimensions Approach to Prayer, a description of what is written in Your Book of Destiny, an Introduction to Curses, the Common Landing Places for Curses,” and Keys to Unlocking Your Prophetic Senses in the Courts of Heaven. By watching these powerful sessions and going through the Courts of Heaven process, you will learn how to put an end to the delays and hindrances to your destiny being fulfilled. Robert Henderson is a trailblazer in apostolic and life transforming teaching in areas of revelation, and impartation and is known for his extensive Apostolic Leadership impacting countries globally traveling extensively with a commitment to disciple nations while he delivers his message of the Kingdom of God, and the Courts of Heaven. A complimentary copy of this CD Study was provided for review purposes. The opinions expressed are my own. 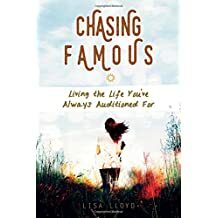 In her book “Chasing Famous – Living the Life you’ve Always Auditioned For,” Lisa shifts the focus from self-seeking affirmation to pointing people to God as the one to be honored. The theme of exchanging auditioning for approval from the crowds and seeking world renown challenges the reader to change the focus and to seek to proclaim the excellences of God. Boldly step out to accomplish your mission of proclaiming the redemptive message of Christ. Lisa’s writing is articulate, relevant, profoundly thought provoking, and rich in illustrative metaphor. Lisa is openly transparent; and shares an account of an incident from her life when she was young, vulnerable, and felt alone and trapped. She also tells of events in her career where God orchestrated unexpected blessing after a period of testing. The ‘Questions to Consider’ feature at the end of each chapter can be easily adapted for use as a Reading Guide for book clubs or a discussion guide for small group Bible studies. Destined to become a spokesperson for a new generation of Christian women, Lisa Lloyd is a successful actress and writer and is a popular speaker at women’s retreats, conferences, and other events, nationally. “Chasing Famous – Living the Life you’ve Always Auditioned For” is highly endorsed by her peers, and by well-known Christian leaders. Moving from a Program Driven Institution to a Learning Community“Learning Change – Congregational Transformation Fueled by Personal Renewal” is made up of stories of church leaders who were able to transform their congregations by first making changes in their own lives. Jim Herrington and Trisha Taylor cofounders of “Faithwalking” worked in a collaborative effort to develop a process focused on personal and congregational transformation. The book is divided into four parts: Part one establishes the keys to real change, defines the key concepts to change and introduces the changes necessary for personal transformation. Parts two and three emphasize four essential core values to reconnecting to our intended design and the mental models necessary for shifting the way we think. Part four provides for equipping ourselves for more effective leadership. I found the features with suggestions for interactive engagement for a better understanding and further assessment of the material to be an invaluable asset for determining implementation, taking action and being authenticate for setting personal goals in creating inner change. Readers will get the most benefit from the book by setting aside an extended time regularly to follow the suggestions for reflections and going deeper, as you move forward in your personal renewal and actualizing authentic congregational transformation. “Learning Change – Congregational Transformation Fueled by Personal Renewal” is timely, relevant, and important; a must read for pastors, church staff, and lay leaders.